Google+ is in full force now, it continues to grow, and its impact can be felt in both organic and paid search. This is readily apparent as +1 buttons have spread across the web, similar to what happened with Facebook Like buttons. One of the ways that Google is enabling businesses to benefit from +1’s is via Social Extensions in AdWords. If you’re not familiar with Social Extensions, don’t worry. This post will cover an introduction to Google’s latest ad extension, explain why you should care about it, and I’ll also explain how to add them to your AdWords campaigns. And by the way, yes, you should care about Social Extensions. Read on. 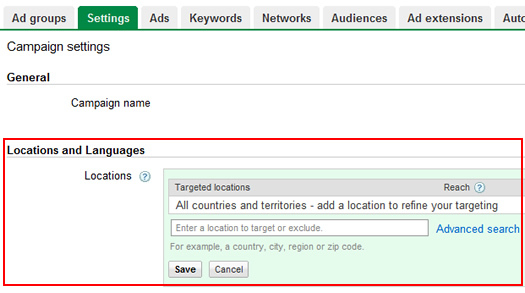 In Paid Search, any time you can attach additional information to your SEM ads, the better. Attaching relevant and valuable information to your ads can be the difference between a click or simply registering an impression. And that can impact Quality Score, CPC’s, and ROI. Google has done an incredible job rolling out various ad extensions that provide valuable information for people searching for products or services. For example, paid search marketers can implement ad sitelinks, product extensions, call extensions, location extensions, and social extensions. I won’t cover each of these extensions in detail in this post, but it’s important to understand that they “attach” information to existing ads. 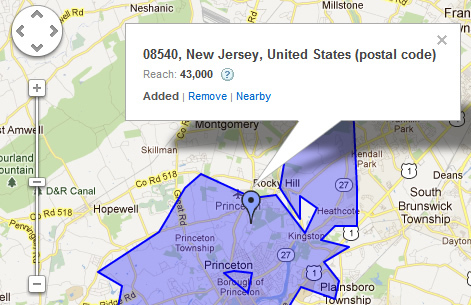 That additional information might be phone numbers, addresses, reviews, sitelinks, +1 annotations, etc. After Google+ rolled out, Google launched a new ad extension called Social Extensions. Social Extensions enable you to connect your Google+ Page to your AdWords campaigns. 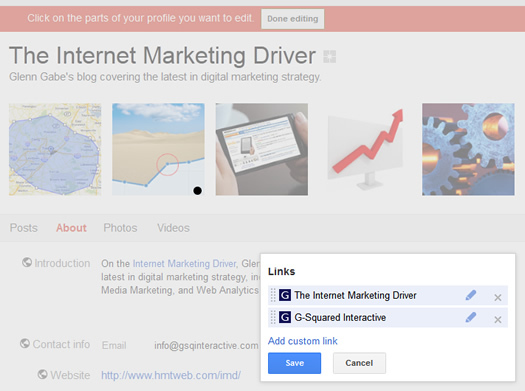 This enables you to share +1’s from your G+ page with your ads, and vice versa. Sharing +1’s gives marketers a greater chance of having +1 annotations show up in their ads (and it obviously impacts the count that shows up, as well). +1 Annotations stand out, as they display the number of +1’s, including social connections that have casted a vote for the business on Google+. Here’s a screenshot of Social Extensions in action (for Dell). Note, Social Extensions can show up in both Search and on the Display Network. As we have all seen with Facebook Ads, social annotations bring relevance to advertisements. If your social connections show up within the ad itself (essentially giving their approval of a business), then it can make a bigger impact. That’s as long as you take that person’s recommendation seriously. Since annotations can show up in both Search Ads and Display Network Ads, this can have a far reaching impact for businesses. The Display Network consists of any website running Google Ads, including Google properties like Gmail, YouTube, Google Maps, etc. It reaches approximately 80% of web users. The fact of the matter is that social annotations work. They take up more screen real estate, they include visuals of your connections, and the number of +1’s the business has received. This can all be very powerful for advertisers, as it can increase the chances of a click-through. Google has stated that +1 annotations have yielded higher click-through during their testing. Let’s say you implemented Social Extensions and were wondering how they were impacting the performance of your ads. You’ll be happy to know that Google addressed this situation by providing a +1 segment in AdWords. 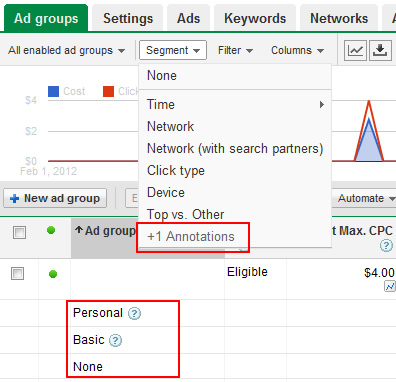 You can access this segment by logging into AdWords, accessing a specific campaign or ad group, and then clicking the “Segment” button, and then selecting the “+1 Annotations” segment. Using the +1 Annotations segment, you can compare the performance of ads that didn’t show an annotation to ads that did. In addition, you can compare both personal and basic annotations to see how they perform. And if you have conversion tracking set up, you can see the impact on conversion. If you’ve gotten this far in my post, I’m sure you are wondering how to add Social Extensions in AdWords! I’ve got you covered. The first thing you need to do is to connect your Google+ Page to your website, and vice versa. 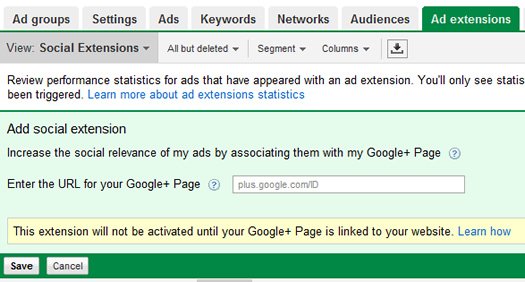 Then you need to add the Social Extension in Adwords. Follow the steps below to add a Social Extension to your campaigns. You can connect your Page and Site a few different ways. In order to verify ownership, Google looks for a rel=”publisher” link on your homepage to a Google+ Page. You can also add the Google+ Badge to your homepage. You can learn more about each method here. 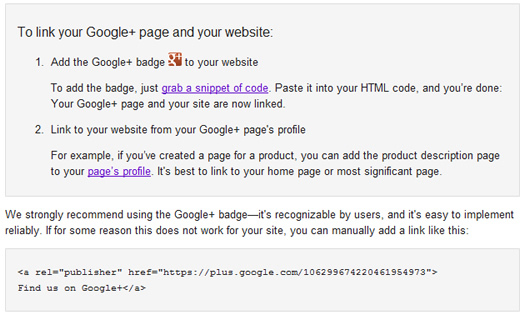 Next, Google wants to see a link from your Google+ Page’s profile back to your homepage. You can easily add this to your Page by editing your profile and then adding links in the right sidebar. After clicking “edit profile” button, you can click the links section in the right sidebar to edit them. Then you can click “add custom link” and enter the label and URL for your homepage. In order to complete the process of adding Social Extensions, you need to add the extension in your AdWords campaign. Access the campaign in question and click the “Ad Extensions” tab. Use the dropdown and select “Social Extensions”. Click “New Extension” and you’ll be presented with a text field where you need to enter the URL of your Google+ Page. You can get the URL by accessing your page in Google+ and copying the URL. Make sure you are copying the URL of your Page and not your personal profile. This is a common mistake. Click “Save” to complete the process. Google will approve the extension if everything is in place. That’s it! Once your Social Extension has been approved, your ads will be eligible to have +1 annotations show up. When running AdWords campaigns, it’s important to take advantage of all the powerful tools that Google provides for increasing performance. Ad Extensions in general can help advertisers increase click-through, build credibility, and land more business. And Social Extensions in particular can bring a social relevance to your ads that’s hard to match. I recommend taking the necessary steps to implement Social Extensions, and then track how they work for your business. You just might find that +1’s, and the relevance they bring to your ads, boost sales and ROI. And that’s the name of the game in SEM.